A new exhibit featuring the painting “Attack on New Ulm” by Anton Gag will open in the James J. Hill House art gallery Sept. 16. Painted in 1904, the work has been displayed in various locations around the Minnesota State Capitol since 1923. 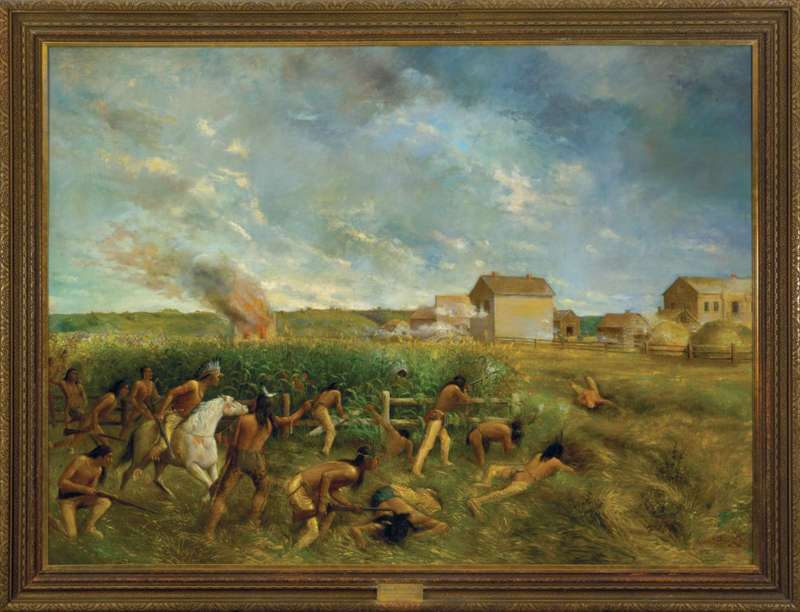 After gathering public input, MNHS’ Executive Council voted to remove the painting from the Capitol in December 2016, given it is not original to the building and represents a single painful moment in the complex story of the U.S.-Dakota War of 1862. “Attack on New Ulm” offers opportunities for learning, dialogue and reflection outside of the Capitol, and this new exhibit at the Hill House features interpretation that explores the painting from multiple current perspectives. The exhibit is also linked to the “Reconciling History: Views on Two Paintings” exhibit, which opened at the Capitol in August. Both exhibits were developed by conducting video interviews with Ojibwe and Dakota community members, historians, Western art experts, and settler descendants. Transcribed excerpts from the interviews are featured in the exhibits, and edited video interviews will be accessible on the Capitol and James J. Hill House websites. Visitors can join the program “Making Meaning on Anton Gag’s ‘Attack on New Ulm” on Sept. 21 & 28 to share thoughts about the varied meanings of this artwork in a small group dialogue. “Attack on New Ulm” will be on display through Jan. 14, 2018 and is free and open to the public.